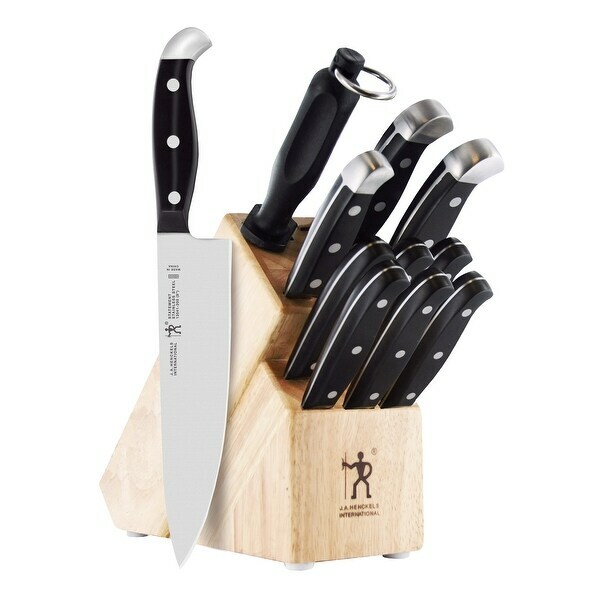 The Henckels International Statement 12-pc Knife Block Set is stocked with tools to easily tackle your kitchen tasks. Honed for long-lasting sharpness, the fine-edge blades boast precision cutting. The all-rounder 8" Chef's Knife is perfect for chopping herbs and dicing onions while the 8" Bread Knife cleanly slices through crusty sourdough. Efficiently mince garlic with the 7" Hollow Edge Santoku, whose blade has small indentations, aka grantons, which prevent food from sticking while cutting. Fabricated from durable, high-quality stainless steel, Statement's single-piece, stamped blade construction is lighter than forged knives. Along with the full tang, this encourages maximum maneuverability. The traditional triple-rivet handles are curved for comfort and balance while the stainless steel endcap adds aesthetic appeal to your block display. Each time you cook, you will want to reach for this useful knife set.